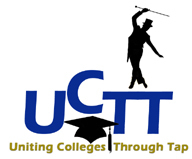 Uniting Colleges Through Tap is a Philadelphia-based tap dance organization. Its members come from area colleges, including Bryn Mawr College, Haverford College, Rowan University, and the University of the Arts - Continuing Education Department. Each year, the company performs a show in the spring. Every piece tributes one of the masters of tap. UCTT's annual show celebrates the masters of tap dance. Come join us!